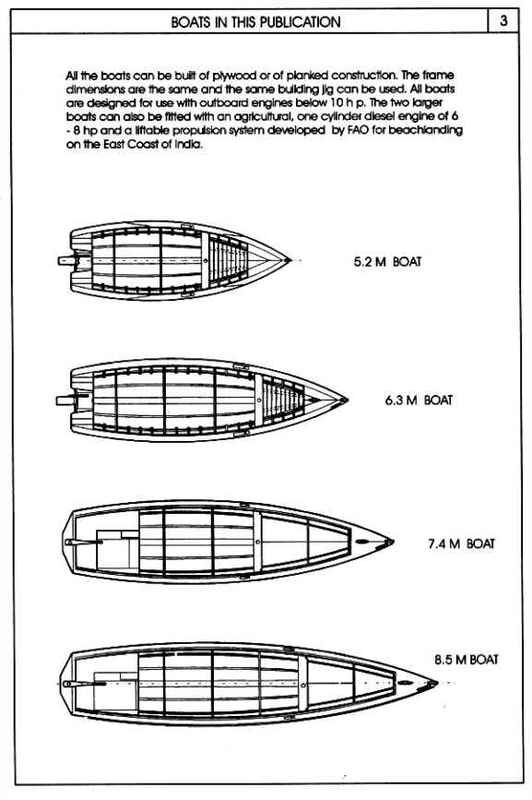 The first FAO publication on V-bottom boats was issued in 1974. The purpose was to present a series of open fishing boats from 4.8 m (16 ft) to 9 m (30 ft) for use in inshore and coastal fishery. 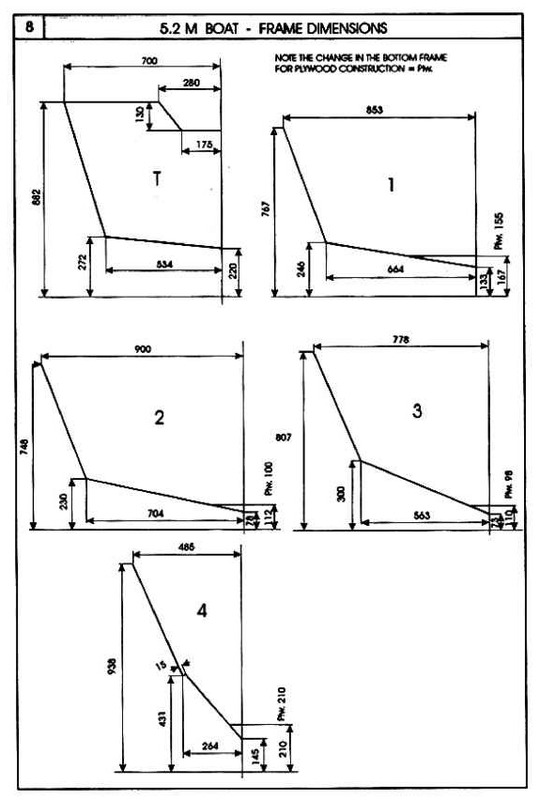 Construction of planks or plywood on the same building jig and with the same construction procedure. Utilizing local timber of standard commercial sizes. Shape of the boat given by a few main frames. Planking done with boards of uniform width to simplify building and reduce wastage. Hull shape well adapted to economical, low powered engines. This new issue of the V-bottom boat publication maintains the basic principles of the first issue as outlined above. However, more than 20 years' development in the field of boatbuilding in developing countries has shown the need for a change in several aspects and with a greater emphasis on the use of illustrations rather than words. Plywood has maintained its role as a material well adapted to use in small scale boatbuilding. Because of the sheet construction, it is relatively easy for carpenters without boatbuilding skills to achieve a watertight boat. For boats that frequently hauled out on the beach, plywood gives a light boat without planking seams that open when the timber dries out. The service life of a plywood boat is determined by the quality of the plywood and dry timber is required to obtain a good glue bond. Traditional boat construction with nails and bolts has the advantage of being able to use cheaper local timber and often timber of better rot resistance than the low grade interior veneers used in plywood. Traditional construction, where each plank has to be sawn and planed to the correct shape, requires great skill to obtain a watertight and strong boat. There is a need to simplify the construction method as much as possible to bring it within the reach of people with little boatbuilding experience. In this new issue of the V-bottom boat publication, only the V-version with the bottom planked transversely or cross planked has been maintained. A longitudinal planked bottom requires closely spaced transverse frames. In temperate climates, oak has been used traditionally for steamed frames together with copper fastenings. Most of the tropical hard woods do not steambend well and imported copper fastenings are expensive. Bolted frames for small V-bottom boats are expensive and time consuming to make and they clutter up the interior of the boat. In the construction of small flatbottom boats, the cross planked bottom is widely accepted as the simplest way to build a boat and it is a method used by boatbuilders in countries as wide apart as Bangladesh and the USA. 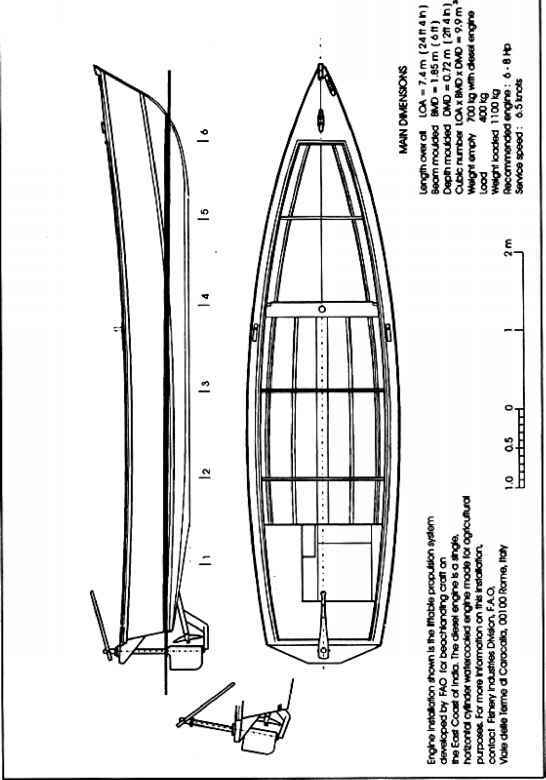 The cross planked V-bottom boat is little known outside the USA and Australia, but it has the same advantages as cross planking in a flatbottom boat: the reduction in the number of transverse bottom frames. 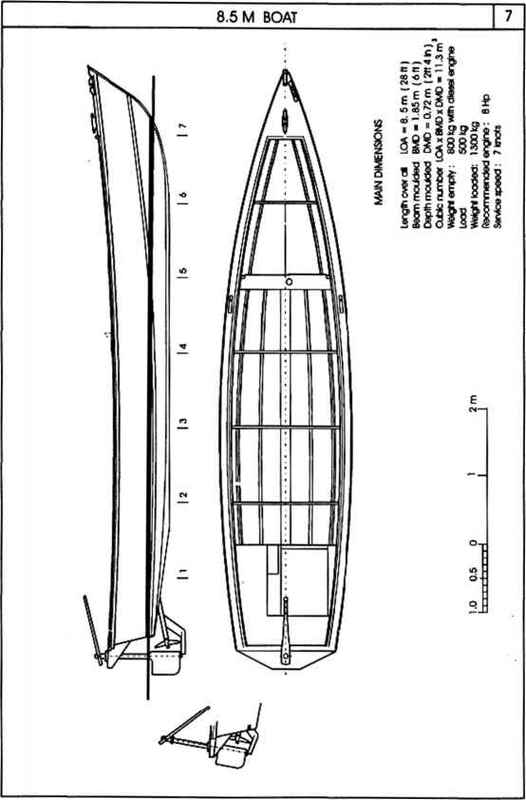 The bottom planking carries the load to the sides and the keel. The bottom framing can be longitudinal, mainly serving to hold the planks together to avoid leaks. 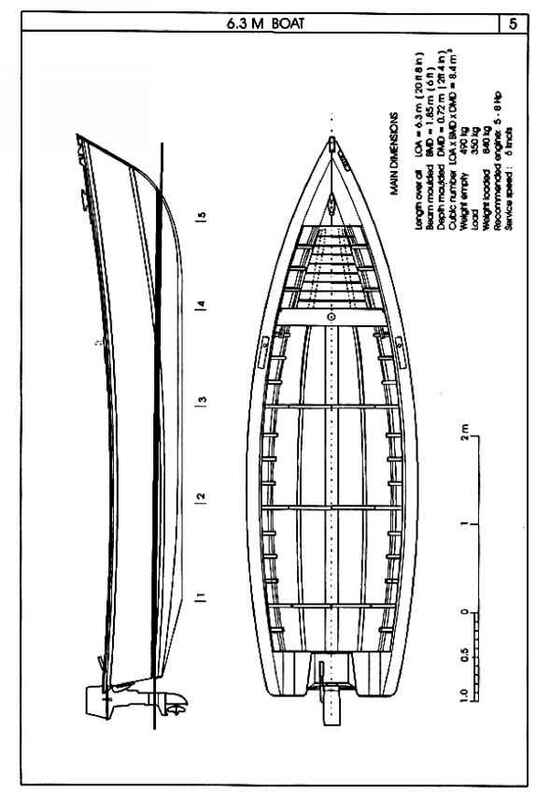 This longitudinal bottom framing is similar to the system used in plywood boats which permits the same main frame system to be used whether the boats are built of planks or plywood, as shown in this publication. Longitudinal planks on the side demand intermediate frames but these can be simply bolted to the chine and do not require much bevelling for the planking. The previous issue had V-bottom designs of typical "Western" proportions with a rather wide beam in relation to the length. In most developing countries fishermen prefer long and slender, canoe-shaped boats and for very good reasons. 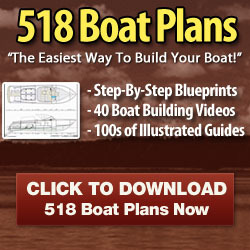 The longer boats will give a better speed with a small engine than a short, fat boat. A certain beam is required for a satisfactory stability. For open boats a waterline beam of around 1.5 m (5 ft) will ensure sufficient stability. 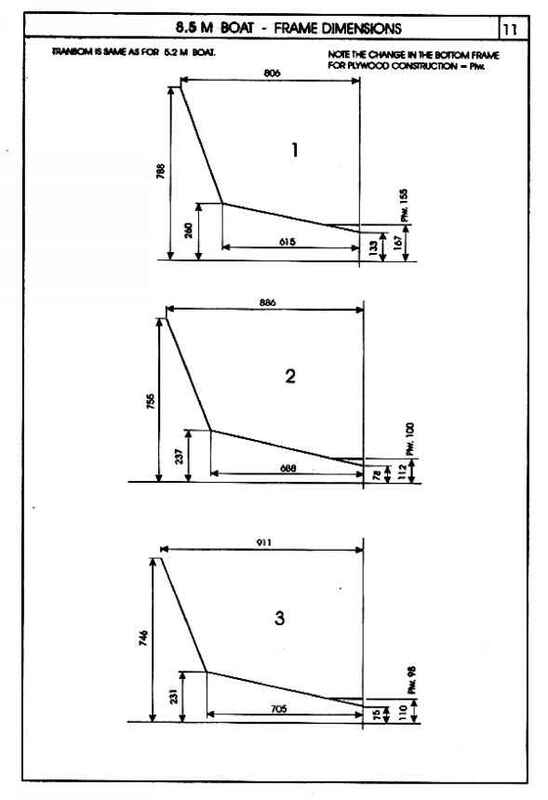 The boats in this publication maintain this waterline beam with an over all beam of 1.9 m (6 ft). The advantage of the longer boats in terms of speed is clearly demonstrated in that the 8.5 m boat will achieve 7 knots versus 5.5 knots for the 5.2 m boat using the same 8 Hp engine. Because of the sharp bow, the longer hulls have very low resistance in waves. The cost of operating a small fishing boat is to a far greater extent influenced by the choice of engine type and power than by the construction material in the boat. It is known that for the same power, diesel engines consume only half the fuel of the outboard engine. The previous publication therefore showed the installation of small, marine diesel engines with built-in reverse/reduction gear. However, the cost of these engines, in spite of all their advantages, has effectively excluded them from use by fishermen in developing countries. Here the market for boat engines below 15 Hp is dominated by either kerosene outboard motors or multi-purpose single cylinder diesel engines fitted without reduction/reverse gear. This latter type of engine is now the dominant small boat engine in Indonesia, Thailand and Bangladesh. The engine is fitted in a conventional way inboard with a sterntube, but without reduction to the propeller which means a fairly small propeller turning at the same rpm as the engine, that is 2000&ndash;2200 rpm, which gives rather low propulsion efficiency. Alternatively, the engine is fitted with a "long tall" and sits on the stern of the boat like an outboard motor with the shaft extending down into the water aft of the boat. Lifting the propeller out of the water acts as a neutral position in a gearbox. In condition with waves there is the disadvantage that the propeller operates near the surface of the water. To overcome some of these disadvantages, the FAO/SIDA "Bay of Bengal Programme" developed a new installation suitable for beachlanding craft on the East Coast of India. The engine is installed inside the boat and is mounted together with the propeller shaft in such a way that the whole unit can be titled and the propeller and rudder lifted out of the water. A rubber bellow ensures watertightness between the pivoting sterntube and the hull. There is a belt drive between the engine and the propeller shaft giving a 2:1 reduction and thereby a larger and more efficient propeller. As for the long tail, there is a "neutral" position when the propeller is lifted out of the water. This is also required for beachlanding and convenient for clearing fishing nets entangled in the propeller. The 9 Hp engine utilized is the horizontal cylinder, watercooled diesel engine widely used for pumping water, generating sets and small tractors. It is produced in large series and therefore at a fraction of the cost of the specially built small marine diesel engine. In 1996 this engine with the complete liftable propeller installation cost US $ 1,150 which was less than the imported 8 Hp kerosene outboard engine. Fishing Technology Service Fishery Industries Division F.A.O. 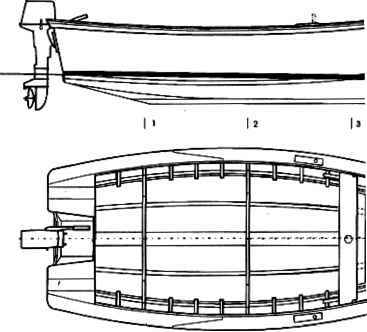 In this publication the liftable propulsion system is shown on the two larger craft. 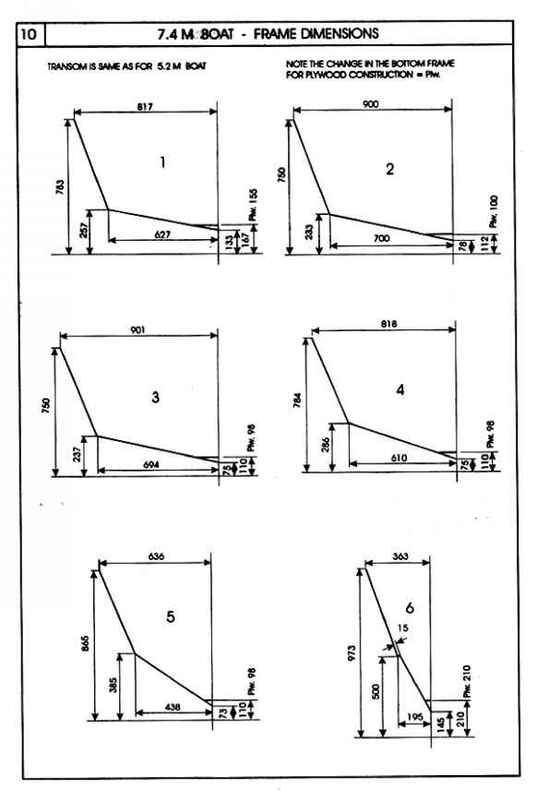 It must be stressed that the designs and the construction shown in this publication are intended for low powered engines giving speeds of up to 7 knots. More powerful engines and higher speed will give high slamming load on the hull and the scantlings are not designed for this. FOR PlYWOOO CONSTRUCTION - P*v.
What is the market size for kerosene outboard engines?